Get Top Google Ranking in ANY City! 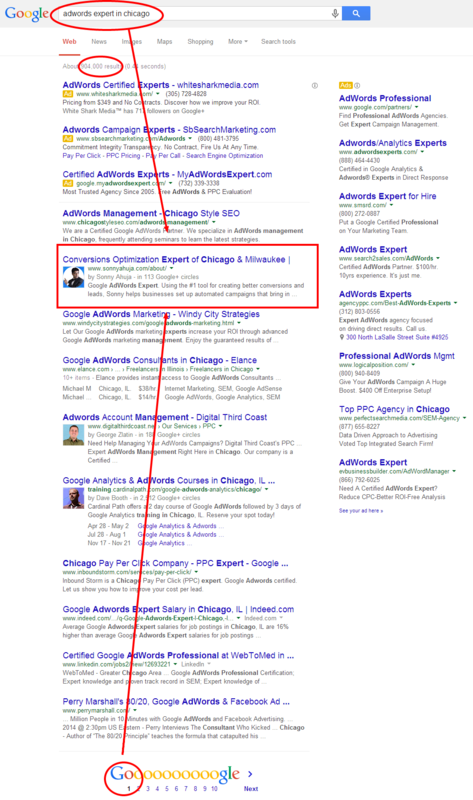 AND I rank #2 as an AdWords Expert in Chicago as well! So this shows that not only am I an Expert in High Converting Web Design and AdWords but that I am an SEO Expert as well. Which is why I love helping business owners in setting up their SEO in creative ways that will increase their sales and conversions exponentially. However, sometimes we just have to face the fact that when starting out in business, we can’t always afford to hire people to do things for us right away. So, if you don’t yet have the cash to invest, and want an SEO Expert’s advice, this video and the 35 tips below it are sure to get you started. 1 – Make sure the keywords you want to rank for are actually in the body of your article. Over using them, however, is seen as keyword stuffing, which will cause you problems. 2 – Use relevant keywords in the ALT & TITLE tags. Again, don’t over use them, and avoid using them on photos that aren’t directly about the keyword i.e. don’t use the keywords on a clipart image of a ‘tick’, etc. 3 – Headings should have ‘H1’ tags, subheadings ‘H2’ tags etc. 4 – Headings and subheading should have a primary keyword, but use it in a way that makes sense of the heading. 5 – Try to keep the number of links in the body of your content to as few as possible. Too many looks suspicious, and you don’t want people leaving your site via a link when they’re only part way through an article. 6 – Incomplete, or ‘under construction’ sites don’t tend to get ranked, and, people who do visit them are unlikely to remember to come back when the site is ‘complete’. 8 – Don’t have a page full of images and no text. Text can be optimized, and is loved by the search engines, images only have tags, and they can be over used far too quickly. 9 – When you’re ready to launch your site to the world submit it to: Google, Bing, Yahoo, ASK.com and MSN; don’t wait for them to ‘find’ you, you don’t have that much time on your hands. 10 – Submit to social bookmarking sites like del.icio.us; directories like the yellow pages; and if you have some money to spend, there are some good PR sites that will get you indexed really quickly. 11 – Don’t make your titles too long, you want the whole thing to show in the search engines. 12 – Create an XML sitemap to makes sure the search engine spiders can find their way around your site. 13 – Have a version of the sitemap that visitors can use to quickly find their way around your site. 14 – Don’t use the latest ‘loopholes’ that are always finding their way onto the IM market; at best they’re short lived, at worst they could get your site removed from the search engine databases. 15 – Robots.txt will help you stop the search engine spiders from following links away from your site, or to parts of your site that you’d rather weren’t indexed. This means they can spend more time finding the bits that matter. 16 – Keep your Meta tag descriptions short, keyword relevant, but don’t over use the keywords i.e. avoid keyword spamming or stuffing. 17 – Don’t fill your Meta Tags with a lot of irrelevant keywords; pick the ones you need, and use no more than 15 words. 18 – Dynamic pages are difficult to ‘spider’ so they’re difficult to get listed, if at all possible, try not to use them. 19 – Check out how your site looks in a number of different browsers; what looks good in one, may not work in another; this could lead to indexing problems because it may mean there’s something wrong with the coding. 20 – Double check that there are no broken links or errors in your CSS, or HTML code. 21 – Duplicate content is bad, no matter what people may say. With all of the billions of webpages out there you may think that a few hundred pages with the same content make up a tiny percentage of the total number of pages, so why would they be worried? That would be underestimating the search engines’ drive to get rid of them; make sure you’re unique and you shouldn’t find your site being de-indexed due to duplicate content. 22 – Don’t specifically track the good search bots; let them roam free and there’s less chance of there being any indexing problem. 23 – Be careful when it comes to using online sites to submit your site, it’s too easy to overuse them, and look like you’re spamming the search engines. 24 – Online submission sites may have picked up a reputation for spamming, so sites submitted via them may not be ‘looked at’ as quickly for indexing. 25 – Don’t create pages that set out to scam, phish, send viruses, or Trojans etc. You could end up with more problems than just not being listed. 26 – Don’t try to trick the search engines into thinking they are sending people to a site about one thing, and having them go to a site about something else; they will pick up on this quite quickly, these days. 27 – Get a good mixture of both high and low PR one way links to your site. Try to make the links back to your site keyword anchor text in the body of good, relevant content. 28 – Avoid getting links from the types of sites the search engines don’t like i.e. scammers, hackers, link farms, etc. The search engines won’t give you any ‘credit’ for them, and may penalise your site because of them. 29 – SEO services can be a great thing to buy, but be careful as some companies use questionable ranking tactics; these won’t do your site any good at all. 30 – ‘Hidden’ text and link stuffing are a no-no. 31 – Your site needs to contain useful content before it will get a decent ranking, lists of affiliate links don’t rank that well, and will probably get removed from the search engine database, if they even make it there to begin with. 32 – The more useful and informative your site is, the more people will want to come back; other sites will link to you as an authority, and the search engines will come back time after time to spider your new content. 33 – Avoid questionable linking methods like having too many reciprocal links, or over using link exchanges etc. 34 – Make sure all of your links work, and try to internally link from the body of your content to other relevant pages you have on your site. 35 – This used to be very popular, but is being cracked down on by the search engines – don’t sell links to, or buy them from other sites. If you can put at least a third of these SEO tactics into action on your site, you should start to see it rising through the ranks. Avoid questionable tactics that can get you removed from the search engines, give the people the content that they were expecting to see when they went to your site, and you’ll be doing better than most of the ‘SEO experts’ online at the moment.